Mars Needs Moms is not your average Disney movie and is actually quite dark at times which include alien abductions and executions. This movie is far from the Disney norm. However, even with these darker elements spiced throughout the story, its good to see that Disney are no longer afraid to push their boundaries as opposed to singing Lions or damsels in distress. It should be noted that the movie is based on the children's picture book by Pulitzer Prize winning cartoonist Berkeley Breathed and I'm sure the author would be quite pleased at how his creation has come to life, especially in 3D. 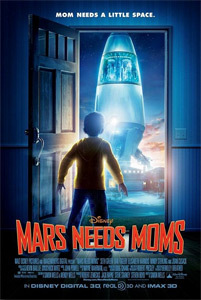 Although a little darker than most Disney films, Mars Needs Moms is still an enjoyable family movie that not only tugs at your heart strings but keeps you on the edge of your seat as you watch this space roller coaster ride unfold. The story is about a young boy called Mio (Seth Green) who has a nice family home and loving parents. Unfortunately when Milo wishes that his Mom (Joan Cusack) didn't exist due to a heated argument for not eating his broccoli and being sent to bed, his wish comes true. Unbeknown to Milo, Martians from Mars have been watching his mother for quite some time in order to harness her good parenting ability to care for their children. The supervisor of Mars (Mindy Sterling), a female Martian dictator/matriarch orders Milo's mother to be abducted. As Milo is unable to get to sleep after his argument with his mom, he decides to go an apologise as he stumbles upon the abduction. He attempts to save his mother by stowing away aboard their spaceship which is heading towards Mars. Milo soon discovers that Mars is far from isolated as female Martians rule the planet under the ruthless Supervisor. Every 25 years, Martian children hatch from the soil of Mars with male children being sent to a huge rubbish pile to fend for themselves and females being reared by nanny bots. By implementing Milo's moms parenting into the nanny bots, female Martians can continue to work for their matriarch. Thankfully Milo is not alone. Joining Milo is Gribble (George Ribble), a human male who has somehow ended up on Mars and Ki (Elisabeth Harnois), a Martian freedom fighter and "hippie" who adores flowers. Together, they are on a race against time to free Milo's mom and uncover the secret behind the perfect Martian family. Even though Mars Needs Martians is steeped in action, the relationship between Milo and Gribble is a treat to watch and if you didn't know Seth Green was playing Mio, you would presume it was a 10-year old boy. Very weird casting but somehow it works perfectly. Dan Fogler's character Gribble helps keep the comedic aspects of the movie going, especially in some of the more "scarier" scenes as does Elisabeth Harnois as Ki as she attempts to insert "Earthisms" into her language. As with most Disney films, there is a message behind this movie and that message is love and family that definitely tugs at your heartstrings throughout the film. The other highlight is the 3D graphics and the lifelike characters, thanks to the digital capture technology from Robert Zemekis' The Polar Express and Monster house. At times, the characters look eerily realistic, especially Gribble as the overweight boy-like astronaut or the way he blushes when Ki speaks to him and was the token romance in the film. Needless to say, the 3D graphics and CGI is truly amazing to watch. In the end, Mars Needs Mom is a fun Disney movie that although quite emotional is filled with action, drama and charm.